The dietary fiber in MySmart Fibergy Plus not only promotes good digestion health and is important to the maintenance of heart health, but it aides in normal bowel regularity as well, which helps move wastes and toxins out of the colon quickly and efficiently. If the colon doesn’t function properly, wastes can back up and recycle through the body. The high fiber content in MySmart Fibergy Plus will also leave you feeling satisfied, making it easy to skip unhealthy snacks throughout the day. Diets high in soluble and insoluble fiber are important for digestive health. 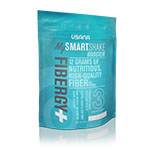 MySmart Fibergy Plus makes it simple to add the benefits of fiber to your daily diet.